I wanted to take a minute and update you on the results of the final 2 events of the season that M-Workz competed in. As you may remember we finished 3rd in RWD Unlimited in the Season Opener at California Speedway with Tarzan Yamada driving. First off was the Super Lap Battle presented by Super Street Magazine at Buttonwillow Raceway on November 7th. This is a difficult event for both the car and the team. It has an elimination feature in the rules that knocks you out of competition if you are slower than 110% of the fastest time in your class. Fortunately we had enough speed to make it to the final round. While I was able to turn a best lap of 1:57.3 in the first session, I asked Billy Johnson to put in some laps in the next session for feedback and to show the true potential of the car. Billy was able to manage a 1:52.9 lap which was good enough for 4th place in RWD Unlimited at the end of the day. We had hoped to improve the front aero by adding a splitter to the front, but were not able to get all the materials in time, so I fabricated a set of canards at the last minute that improved the aero balance compared to our testing at Willow Springs the week before. 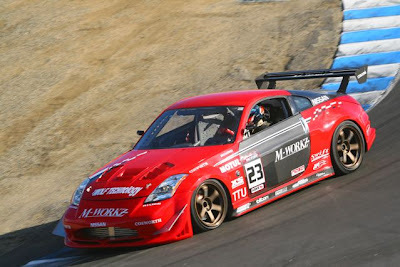 Next was the Redline Time Attack Finals at Laguna Seca only 2 days later. This event was also a real challenge as all cars had to stay under a 92 dB sound limit imposed by the County. There were some very interesting solutions to this problem that some competitors tried. There were extra mufflers, turn downs, periscopes and dryer ducting. We opted for a turn down and lifting off the throttle as you passed the sound station. Once again Billy Johnson put in some fast laps in the finals and tuned in a 1:33.004 for 4th place in RWD Unlimited. Just as a point of reference, that lap time would have put him 27th place on the grid for the most recent World Challenge GT race at Laguna Seca last month. Very impressive driving and good car preparation were key ingredients in this result. The fastest car overall at the event was only 1.6 seconds faster, so we were right there in the hunt. After this event I am confident in saying M-Workz has the fastest 350Z in the US. With some more work over the winter we will get even faster. I would also like to thank all of my sponsors that helped me achieve these great results this year. Jim Wolf Technology, Cosworth, XS Engineering, Swift Springs, Rays Wheels, NISMO JP, Motul, Tilton, Stoptech, Nissan Motorsports, Aerodynamic Solutions, Technosquare, AIT Racing, TSR Fabrication, C&R Racing and Courant Communications. I also want to specially thank Billy Johnson for the awesome driving and feedback.